Crazy roads. That’s what they’ve built in Costa Rica, so that’s what we drive on. Narrow paved roads with no shoulders and lots of hairpin turns. Narrow gravel roads with potholes and washboard ruts and more curves than a coiled fer de lance. 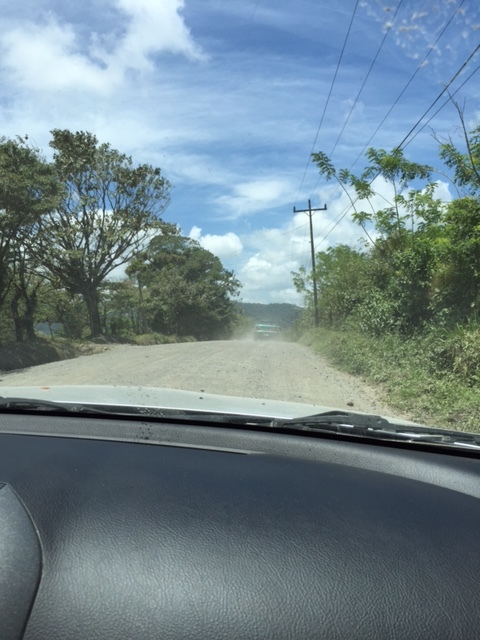 Narrow and winding is how they build roads in Costa Rica. I asked the owner of Villa Encantada why they haven’t paved the road to Monteverde cloud forest, one of the country’s top tourist attractions. “The government has more pressing concerns,” he told me. As we bounced along the dirt road for over an hour, driving playground-zone speed, my teeth loosening from my gums and the persistent squeak from our rental Toyota growing ever louder, I had to wonder if the country’s dentists and car mechanics were somehow in on the non-paving plan. It took us two hours to drive 70 kilometres. Many smaller roads aren’t paved and travel is sloooow and dusty. After dark, with no street lights to illuminate the way, the roads become ever more perilous, as we’ve found out on two occasions while racing the sunset home. And somehow, both Avery and Bennett are able to fall asleep in spite of (or perhaps because of) the drunken swaying of the car — it becomes rather like a giant bouncy chair, the kind that used to vibrate them to sleep as babies. 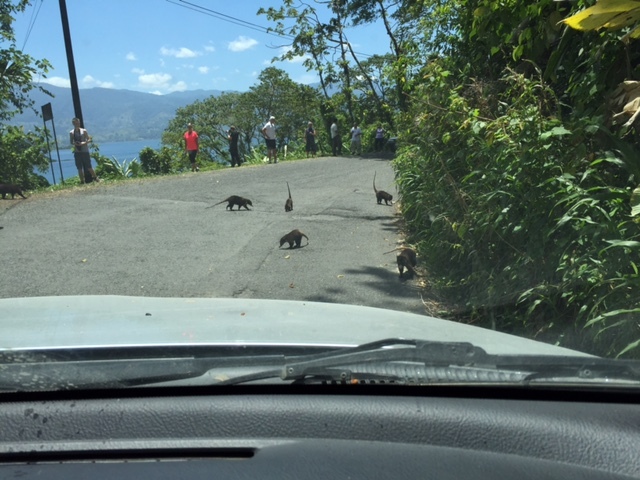 Costa Rica’s answer to Canada’s roadside mountain sheep: coatimundis, which are racoon-like scavengers. On those occasions when the drive is going smoothly, bands of roving coatimundis wander across the pavement midday to keep me on my toes (read: my foot hovering over the brake pad). Yes, we’re surviving las carreteras locas, and they’ve prepared us for the ocean, where we face las olas locas = crazy waves. 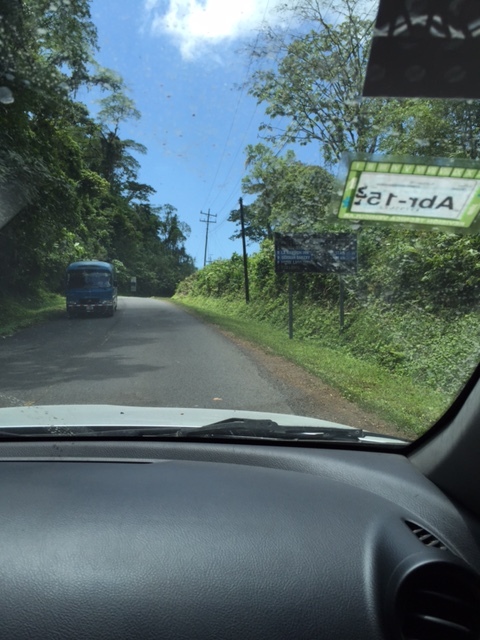 This entry was posted in Travel and tagged Costa Rica roads, driving in Costa Rica, travelling in Costa Rica. Bookmark the permalink.